The Electrical Contractors’ Association is the main trade association for contractors involved in electrical engineering projects in England, Northern Ireland and Wales. 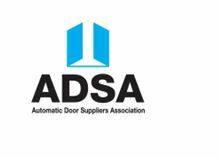 ADSA exists to promote the highest standards in automatic doors and to help specifiers and customers obtain the best solution for their requirements. ADSA first developed the industry code of practice. This covers the safety aspects of automatic doors for pedestrian use. This subsequently formed the basis of BS 7036: 1988, a code of practice for provision and installation of safety devices for automatic, power operated pedestrian door systems.